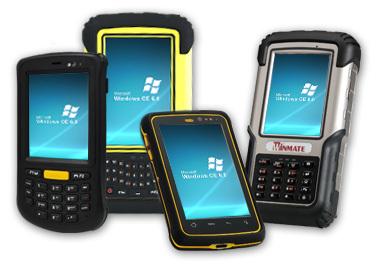 Winmate is once again extending a full range of fully rugged Windows CE based handheld, the product line range from 3.5 to 4.3-inches and share many common specification such as processor, high bright displays, and wide range temperature. Our product series start from 3.5-inch (C350T), 3.7-inch (S370T), and for 4.3-inch we provide our S430T-CE and E430T. All of these products provide the rugged attributes of handheld form factors. As its design and looks imply, the Winmate Win CE-based rugged handheld device is a rather rugged machine. It can handle 4-foot drops to concrete and it carries IP54/IP65/IP67 sealing (depends on the model) which means it's completely impervious to dust and is even protected against complete immersion (within limits).